The Oakland-Hayward-Berkeley, California housing market area (HMA) is located in HUD's Pacific region. The economy in this HMA is experiencing strong economic growth along with tight housing and rental housing markets. 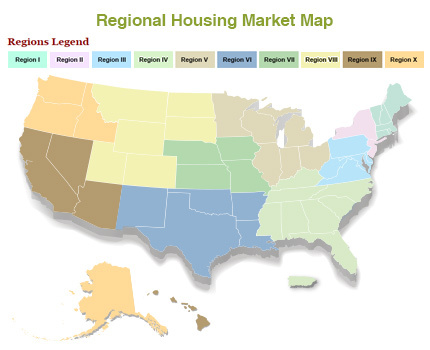 HUD’s Comprehensive Housing Market Analyses provide information on changes in local economies, housing markets, and populations and provide 3-year forecasts for demand in the area. This article is part of a series that sheds light on the content of these analyses. The Oakland-Hayward-Berkeley, California housing market area (Oakland HMA) on the San Francisco Bay in northern California is experiencing strong economic growth along with tight housing and rental housing markets. The Oakland HMA includes Almeda and Contra Costa counties and has an estimated population of 2.78 million people. Employment growth has been strong in the area since 2012, a welcome turnaround from the employment losses of the recession, which were greater than the national average. Oakland is one of the nation’s most expensive cities, and the growing economy will put an even greater strain on housing affordability in the area. Multiple large construction projects are spurring strong growth in the Oakland HMA. In 2016, the education and health services sector, the HMA’s largest employment sector, also experienced the region’s largest job growth. Kaiser Permanente, which, with 27,000 workers, is the region’s largest employer, recently completed the 349-bed Oakland Medical Center. Many other regional hospital and medical facilities have also expanded recently, adding four new inpatient medical centers to the area. These expansions were necessary to meet the deadline for enacting the state of California’s earthquake safety standards requirement, which was set in Senate Bill 1953 in 1994. The Bay Area remains a popular tourist destination, which has led to employment growth of 4.9 percent, or 5,200 jobs, in the leisure and hospitality sector. The report attributes some of the increased tourism to the marketing campaign of Oakland’s tourism bureau, Visit Oakland. Visit Oakland’s marketing campaign has contributed $198 million toward waterfront improvements at Lake Merritt and the Oakland Estuary. This increase in tourism has prompted development proposals for 25 new hotels in the HMA over the next several years. Other public-sector construction projects include the rehabilitation of Oakland International Airport and expansions at the University of California, Berkeley. The University of California, Berkeley, which employs 21,400 people and is the area’s second-largest employer, is building a new residence hall and expanding its business school facilities. These projects, among others, caused the construction sector to grow by 7.4 percent, or 4,700 jobs, in 2016, making it the Oakland HMA’s fastest-growing employment sector. Strong growth is expected to continue over the next few years, with employment gains occurring across sectors. The home sales market is very tight, with a vacancy rate of only 0.6 percent. In 2016, there were 34,600 new and existing home sales, a 3 percent increase over the previous year. In fact, strong economic growth has caused home sales to climb by an average of 3 percent since 2014. Sales prices in 2016 also increased by 8 percent to an average of $710,600. The high demand and high home sales prices have made housing in the area unaffordable. For example, from 2010 to 2015 home sales prices increased by 57 percent while average income increased by only 14 percent. Home sales prices vary from neighborhood to neighborhood and depend on various factors, including proximity to mass transit and general proximity to the bay; inland areas tend to have more affordable housing. The Oakland HMA rental market is also very tight, with a vacancy rate of 2.7 percent. Demand for rental units has been rising since 2010 as people seeking more affordable housing move to Oakland from San Francisco and San Jose, and as the area’s growing economy attracts more people. The area’s apartment market is also tight, with a 3.3 percent vacancy rate and a 3 percent increase in the average apartment rent. Housing affordability is a pressing issue in the San Francisco Bay Area, and many people are leaving the area to find more affordable housing. However, displacement presents many challenges for communities and their residents — particularly for the elderly, who are at a higher risk of displacement. To address the issue of housing affordability for seniors, the Oakland Housing Authority opened Lakeside Senior Apartments in 2015. The development features 91 one-bedroom units for seniors who earn no more than 50 percent of the area median income. Lakeside Senior Apartments offers views of Lake Merritt and has won awards for its design. Over the next 3 years, demand is expected for 19,200 new single-family units. The 3,075 units currently under construction will help satisfy some of this demand, as will the few vacant homes currently available in the market. The demand for market-rate rentals is expected to be 19,600 units over the next 3 years. In 2016, 4,350 multifamily units were permitted for construction, a 15 percent increase from 2015, and their completion will help meet some of the demand for rental units in the area. Housing affordability is pressing issue in the Oakland HMA and the greater San Francisco Bay Area in general. As the economy continues to grow, housing demand will remain strong. Although many housing developments are underway or in the planning stages, demand will continue to be high over the next several years, leading to increasing home sales prices and decreasing affordability.